The actions of more than one driver often combine to cause chain reaction accidents, and courts consider all drivers involved and assign a percentage of fault to each to determine responsibility for injuries and damage. An auto accident attorney often assists drivers who are involved in chain reaction accidents in determining if they are entitled to compensation for their injuries based on their portion of contributing fault. In some cases, a single driver or road condition may be at fault. Frequently, however, chain reaction accidents are the result of the combined actions of multiple drivers, road and weather conditions. Illinois law requires courts and juries to consider the contributory fault of each driver and road condition involved in an accident. They assign a proportion of responsibility to each to determine what damages the parties may be liable for and how much compensation may be recovered for injuries sustained by others in the accident. A comparison between the contributing factors of all persons involved in the accident provides a percentage of fault and liability for each. For example, a driver assigned sixty percent of the fault may be held liable for sixty percent of the damages and no more. A driver assigned fifty percent or more of the fault in an accident cannot recover damages from a driver with a lower assignment of contributing fault. 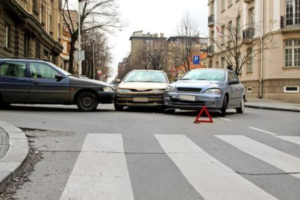 In reviewing a case for damages in a chain reaction accident, an auto accident attorney examines all contributing factors to determine if a victim has a claim. As long as drivers are assigned less than fifty percent of the contributing fault in a chain reaction accident, they may be entitled to recover compensation according to their portion of contributory fault.